Anti-Semitic incidents on U.S. college campuses have continued to grow in 2018, with at least 384 recorded incidents in the first half of this year, according to a new report showing the number of genocidal expressions towards Jewish hit new highs on campuses across the United States. A new report by released Wednesday by pro-Israel organization the AMCHA Initiative, a group that tracks anti-Israel and anti-Semitic activity on college campuses, shows that much of the anti-Semitism on U.S. campuses is the result of activity by anti-Israel activists who promote imagery such as swastikas and tropes calling for the destruction of the Jewish people, according to the report. 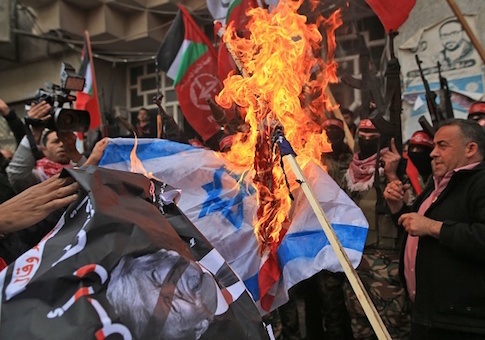 Genocidal expression, such as images and language promoting the killing of Jews and destruction of Israel, "rose dramatically" over the past years, with at least 75 percent of such incidents "involving classic anti-Semitism" and "genocidal expression," according to the report. The number of such incidents appear to have dropped slightly from 2017 to the first part of 2018, the report notes. Most notably, according to the report, "Israel-related incidents were significantly more likely to contribute to a hostile campus," the report found. The AMCHA report puts figures to a range of anecdotal and reported conflicts on college campuses across the United States, where anti-Israel and anti-Semitic activity continues to flourish. Pro-Palestinian campus activists continue to aggressively silence those in the Jewish community and foster an unsafe environment for many Jewish students. The Washington Free Beacon reported last week that Stanford University was investigating a student who threated violence against Jewish students on campus in what is just one example of the unsafe environment stirring many college campuses across the country. "Israel-related incidents with intent to harm were 6.5 times more likely to have multiple perpetrators and 7 times more likely to be affiliated with groups than classic incidents," according to the findings. However, the number of "classic anti-Semitic incidents" still outnumbered "Israel-related incidents three to one," according to the report. Much of the anti-Semitic and anti-Israel activity has centered around efforts by anti-Israel activists on campus to promote their views and suppress the free speech of pro-Israel activists and those in the Jewish community. "Suppressing speech and ostracizing and excluding Jewish and pro-Israel students from campus life were the most common features of Israel-related anti-Semitic incidents," AMCHA found. At least 44 percent of the Israel-related conflicts on campus "involved behavior intended to silence expression, including shutting down, disrupting, defacing, or other attempts to interfere with Israel-related events, displays, or trips," according to the report. Perhaps most startling, 76 percent of recorded incidents against Jewish and pro-Israel students "involved behavior that directly and personally targeted students or groups for denigration or discrimination in order to ostracize and exclude them from campus life," according to the report. Efforts to silent and exclude Jewish students on campus continued to manifest in 2018, following growing trends of past years. "Attempts to silence pro-Israel expression stayed relatively constant," according to the report, while "incidents involving attempts to ostracize or exclude pro-Israel students and staff from campus life more than doubled." In addition, "attempts to ostracize and exclude pro-Israel students and staff became much more flagrant" this year, according to the report. "Incidents including open calls to boycott interaction with or expel actual on-campus students or student groups increased from 3 in 2015 to 4 in 2016 to 14 in 2017, and 18 in the first half of 2018 alone." "Recognizing that anti-Semitic incidents given equal weight in an audit may not have an equal impact on Jewish students, either individually or collectively, this study sought to go deeper than previous studies and look beyond the tallies to better understand how anti-Semitism affects American campuses today," AMCHA wrote in the report. "Our examination revealed that Israel-related anti-Semitic incidents were considerably more likely to contribute to a hostile environment for Jewish students than incidents involving classic anti-Semitism, and that anti-Israel campus activities are no longer intent on harming Israel, but increasingly, and alarmingly, they are intent on harming pro-Israel members of the campus community," the organization noted. This entry was posted in Issues and tagged Anti-Semitism, Israel. Bookmark the permalink.